A typical horizontal continuous casting unit for copper tubes consists of a mains frequency cored melting-holding combined furnace with metal flowing under surface, a crystallizer, a cooling water distribution system, a servo control withdrawal system, an in-line synchronous saw, a saw for mold changing, a hydraulic system and an electric control system, etc. A typical mains frequency furnace adopts a new combination structure of melting-casting with metal flowing under surface. The inductor adopts a vertical structure with silicon sheets imported. As the molten metal flows from the melting furnace to the holding furnace under the surface, the heat emission (that would be otherwise caused) is avoided so as to reduce the energy consumption. Meantime, the metal loss is also reduced. As the exposure of the molten metal to the air is substantially reduced, the product quality can be stabilized and enhanced. The parameters of the melting-holding furnace like voltage, amperage, effective power and compensation factor are indicated with signals. 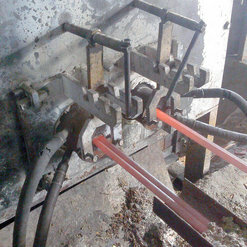 The metal temperature in the furnace is continuously measured and displayed. Also indicated are the temperatures and pressures for the water for cooling the inductor coils, wrapping sleeves and cables with necessary optic and acoustic alarms equipped. 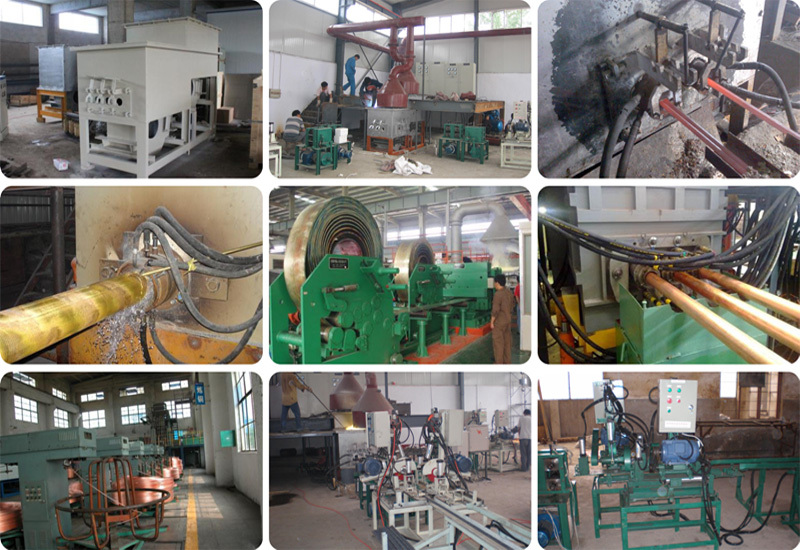 The Copper rod horizontal Continuous Casting Machine is a melting and holding furnace with a cooler, together with graphite die and cooler assembly and run out track with withdrawal machine and cut-off device. Molten copper flows from the crucible into the graphite casting die which is cooled with the help of a highly efficient cooling jacket. Water-cooled graphite dies are attached horizontally to the holding crucible. During the continuous casting operation copper flows into the graphite casting die where it solidifies. The solidified strands are intermittently withdrawn by the withdrawal equipment. Melting furnace is vertical structure and welded by steel plate, and the furnace consists of furnace body, inductor, tilting furnace system, electrical control. and about the Holding furnace, which is used for thermal insulation and traction. The holding furnace can be used separately, also can be used with melting furnace together. Distance between two wheels can be adjusted; available For dimension 10-65mm copper; Adjustable tracting speed; To tract the copper straightly, improving the production and quality. Titighen the copper both the vertical and horizontal direction; High cutting efficiency and precision; Automative collection of the cutting slag; Low-voltage on the control cabinet for safe operation. Hydraulic motivation for sending; Widely use for pipe, bar, flat, and irregular metal. The continuous casting machines are used for the manufacture of copper alloy, brass, bronze and zinc bars, tubes, sections, strip, brass rod, brass forging rod etc.